Just fill in the blanks when you order the shirt. The ship Silhoutte is made to look like the actual ship that your Sailor's barracks are named after. I have designed each one of them for the shirts and they are also available on the mataching PIR Hotel door banners. 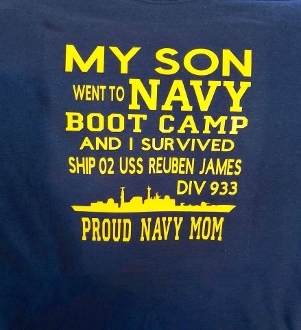 I can also do them for Kids, My Dad/Mom etc went to Navy Boot camp and I survived, DIV 000, Proud Navy Kid/Son/Daughter/Baby etc.